This is one of if not my Belgian Quad. It’s a very malty ale with rich flavors and complexity. I have purchased this beer on many occasions, in bottle and in 1/6 kegs or parties. This was also one of the featured beers at the Belgian Event. This will be the first time I’ve had this beer since starting the blog so I figured it was time for a real review. This bier pours slightly cloudy dark brown with rich amber reddish hues and a rich off white almost tan head. Oh those rich Belgian roasted malts are unmistakable on the nose, what a nice aroma. The unique Belgian yeast strains give these roasted malts a different character then say roasted malts from a stout. There is also some other sweetness and a slight dry hop or maybe some alcohol on the nose. Wow, What a Bier! This is the type of beer that just makes me melt. So delightfully smooth and enjoyable. The experience starts out with sweet roasted malts upfront then just when you think it’s going to coat you mouth you feel this effervescence over your tongue. The back end of the taste gives you more of that sweet roasted malt and a surprisingly dry finish. I assume the dry finish is from the alcohol since you don’t really taste any pronounced hop flavors. One of the most impressive things about his beer is that you don’t taste the alcohol. It is surprisingly masked very well in the complexity of this superb brew. The complexity of this beer is amazing. You really pick up something different with every sip, even more so as it warms and opens up a little. I am a little taken back by this particular vintage. I have had this beer several, actually many times before, bottled and draft but this is the most different one I’ve had. Like I said earlier each batch of these bottle condition beers are slightly different form each other. To me that is just the one characteristic of a craft beer. This particular batch is vey different. If I have not had this before I would assume it was a Belgian Dubbel or strong Dark not a Quadruple. From previous experiences with this beer you could not mistake it for anything but a Belgian Quad. This beer also seems to be lighter in color. This is still a dark brown but you can see through it and it has more of a reddish hue. I remember this beer being almost completely opaque with just a little light coming from the edges of the glass. Now don’t get me wrong this is still a fantastic beer, just a little different from what I’ve had in the past. I can start to feel the warming effect in the alcohol of this beer. That’s hitting the spot tonight since we are being hit with an unexpected snow storm that may bring up to two feet of snow. That’s about two feet more snow then we had all of last year. And this was after the porch was shoved at least three times during the day. This beer also pairs well with a sharp cheese. Toward the end of this review I starting eating some sharp cheddar cheese with this beer and it paired pretty well. Even as different as this beer seems tonight it is still an A. But I will have to get another bottle later on and see who different that bottle is. Before I end this review I want to talk about the lees. The lees is the yeasty sediment in the bottom of a bottle conditioned beer. Some people like the lees and some don’t. The most important thing about the lees is not to pour it in the beer unless you really want it. Lees is normally consumed pretty much by itself with just an once or two of the ale. The lees will change the taste and mouthfeel of the ale so you really only want to consume it unintentionally. I have seen so many reviewers on YouTube pour the lees in like they would the wheat sediment in a Hefeweizen. Then they wonder why the beer is not as good as they expected. I purposely tried a beer at a Belgian tasting with and without the lees and to me they were two completely different beers. So my general rule of thumb for these styles of Belgians is; pour un-hurriedly in a round bottom glass or goblet and leave a couple of ounces in the bottom of the bottle. Then after you have experienced the beer as intended by the brewer pour the lees in a glass and try it agian. The lees of this beer is very yeasty and almost chalky. There is also an almost sour characteristic to the lees. If I would have poured this lees into my full glass it would have completely change my beer experience. The lees definitely masked the other more subtle characteristics of this brew. There is also a more bitter taste to the lees. 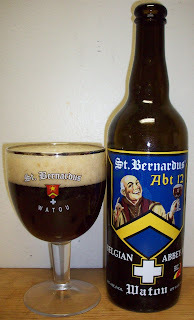 Well, I guess that’s enough of the St Bernardus 12. I will have this again and will update this review or post a new review and reference back to this one. This is one fantastic beer, even if this particular patch wasn’t as good as I’ve had in the past.